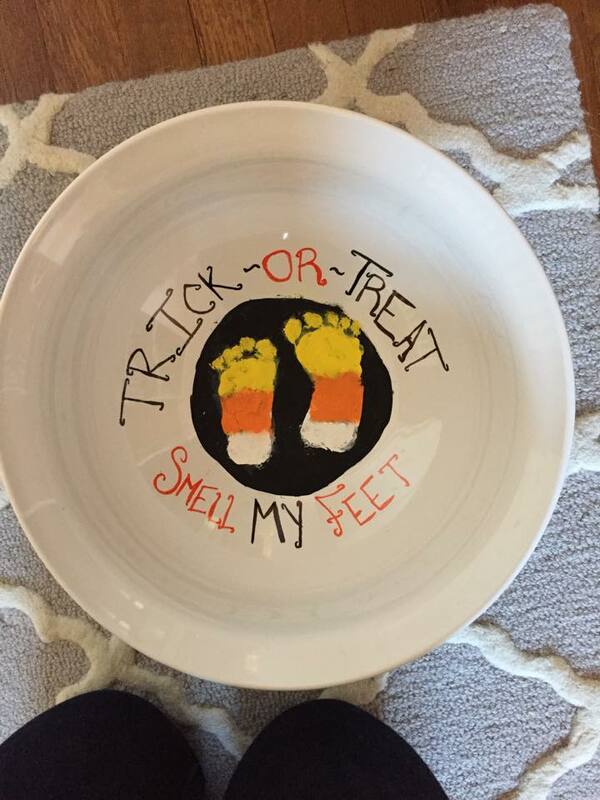 A couple weeks ago, for our big arts and craft project for the month of October, baby L and I made a sweet Halloween Candy Bowl for her family to pass out treats to all the neighborhood children during her first Halloween, in the hopes that this item would become a long standing cherished piece of functional children’s artwork in their family. Even though it was a bit time consuming, the project as a whole was rather easy and turned out really well! Therefore I thought we would share it here to inspire others in getting their creative juices flowing this holiday season! Ceramic Bowl of your choice – we found ours at Target but they can be purchased in practically any retail store, including dollar tree! Squirt Paint onto a plate making sure to leave enough room between colors so they do not mix. 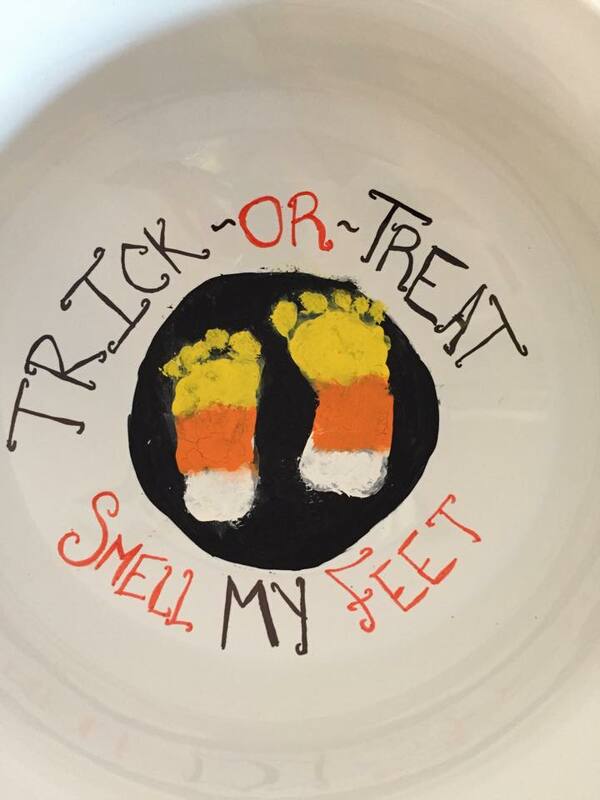 Take paint brush and dip into black paint, then paint a circle large enough to place babies foot prints in. Make sure to fill in the circle with the black paint and allow to dry before continuing. To speed up the drying process you can use a hairdryer to dry the paint. 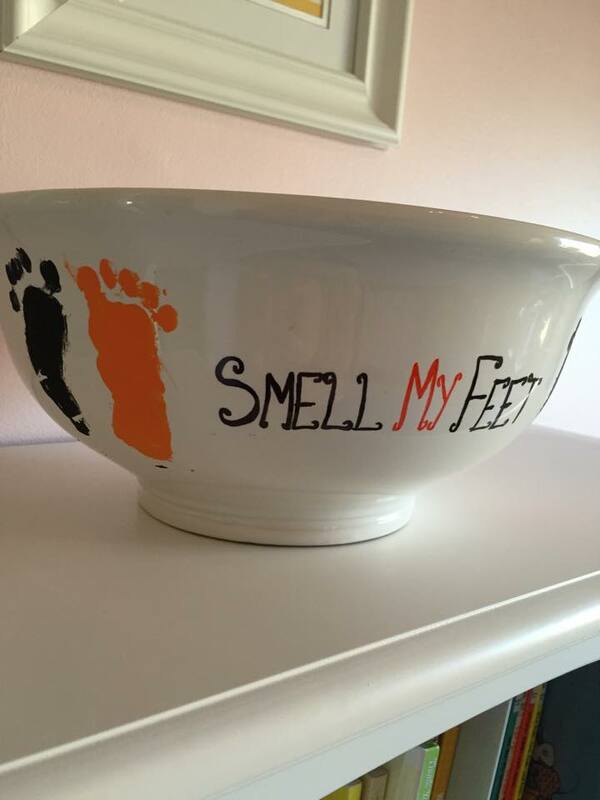 After you have done this write the words “Trick Or Treat” above the circle and “Smell My Feet” below it with the Black and Orange permanent markers. Allow this to dry. Next take paint brush and dip into the yellow paint, then paint the top of babies foot. Then take another paint brush and dip it into the Orange paint and paint the middle of your babies foot. Again, take another paint brush and dip it into the White paint and paint the bottom of your little ones foot. This will complete your Candy Corn design. Now take the painted foot and place it in the middle of the black circle that you painted and allowed to dry earlier. Make sure to completely wipe off your child’s foot after you have finished making the print. This will cut down on clean up and extra messiness in the long run. Repeat steps 5-8 on your child’s opposite foot. Allow design to dry completely. Preheat the oven t0 350 degrees. After you have completed your design and the dish looks exactly how you want it to place the dish in the heated oven for 30 minutes. Once the time is up turn the oven off and allow the dish to sit in the oven while it cools. This helps to seal the marker onto the ceramic material better. 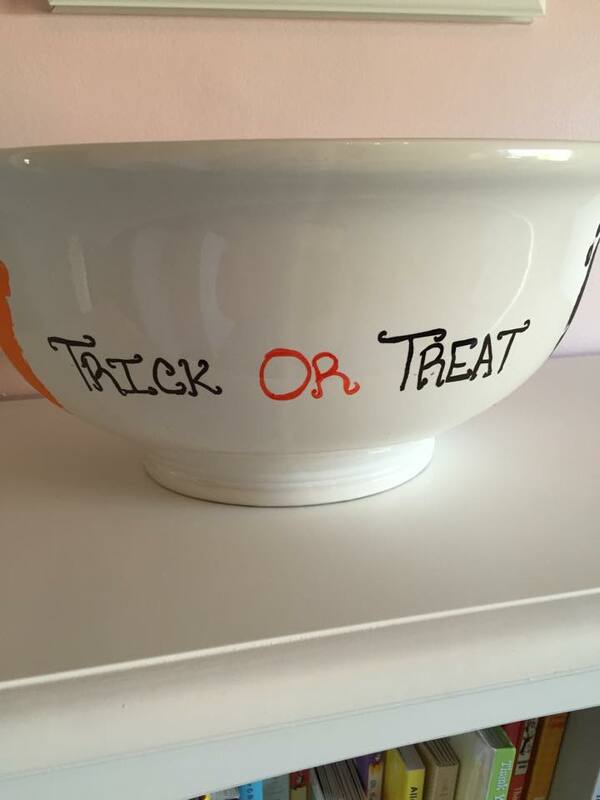 Lastly place your families favorite wrapped Halloween candy in the bowl to pass out on Halloween or Trick or Trunk night and relish the idea of having a special keepsake of your babies childhood for generations to come! A side note on this project, I personally would not test the strength of the materials by washing them, especially the paint. This is a decorative piece and for safety purposes should be used accordingly. Like I mentioned above the only items I would feel comfortable putting in this bowl is wrapped candy or other items of the like. We hope this inspires you and your little ones inner artist and helps to get your whole family in touch with their creative side as well as make a lasting childhood memory.